The Grand Design Solitude test unit was finished in the optional Cabernet full-body paint, with two layers of clear coat. An extended-stay RV, this fifth-wheel travel trailer boasts features that give it the look and feel of a true residence on wheels. Since Grand Design RV launched in 2012, the company has been a rising star. 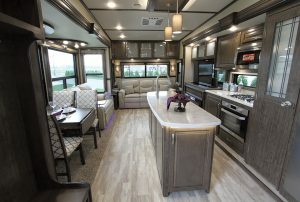 Founded by industry veterans Don Clark, Bill Fenech, and Ron Fenech, the company has focused on producing quality RVs and offering superior customer service. The result has been a flood of enthusiastic owners. The company’s success also attracted the attention of Winnebago Industries, which purchased Grand Design in October 2016 and continues to operate it as a separate business entity. 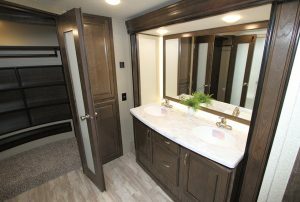 I recently had the opportunity to inspect the 2019 Grand Design Solitude 373FB, an extended-stay fifth-wheel travel trailer ideally outfitted for people who spend a lot of time in their RV. A double-sink vanity graces the main bath in the Grand Design Solitude. The Solitude is billed as the most spacious fifth-wheel ever built. At 101 inches wide, it is indeed wider than the typical 96-inch-wide fifth-wheel. The increased size offers a number of benefits. For one, the resulting wider frame rail spacing provides a better leveling jack stance and allows for more of the flooring to rest on the frame rails rather than on the outriggers, creating a more stable floor. Most fifth-wheels with a rear lounge incorporate either a narrow sofa flanked by end tables or a wide sofa with no end tables. The increased width of the Solitude allows for an 81-inch-wide sofa at the rear, plus end tables. Of course, the extra 5 inches of width also provides more interior space throughout the RV. The Solitude incorporates upgraded I-beam frame rails. The main rails measure 10 inches wide on triple-slideout floor plans and 12 inches wide on quad-slideout floor plans. The 373FB I reviewed is a quad-slideout unit. Grand Design also uses 10-inch I-beam rails on the drop rails instead of the typical 8-inch rails used throughout the industry. All of the slide rooms and the six-point automatic leveling jacks use hydraulic power instead of electric. 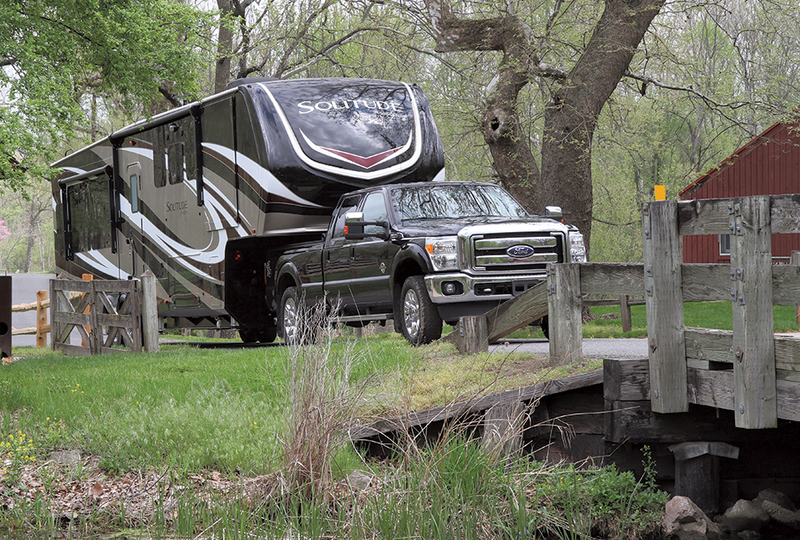 The frame rests on dual 7,000-pound axles with eight-lug wheels and is supported by an Equa-Flex suspension, while a Trailair Rota-Flex hitch connects to the towing vehicle. A five-sided aluminum cage forms the body of the RV, and the only wood used for structural purposes is found in the roof trusses. A radiant foil barrier and two layers of fiberglass insulation in the main floor yield an impressive R-45 value, while the slideout floors have an R-24 insulation value. The sidewalls, rear wall, slideout end walls, and slideout roof feature welded aluminum frames laminated with rigid foam insulation, yielding an R-11 value. The R-40 roof includes fiberglass insulation and radiant foil that extends along its length and continues to the bottom of the front cap. A vented attic allows condensation to escape the roof structure, improving the effectiveness of the insulation. Fiberglass insulation under the gooseneck and 1.5-inch-thick rigid foam insulation in the baggage doors complete the package, and aluminum rails hold the corrugated underbelly barrier tight to form a better seal against the elements. The end result is that the Solitude is touted as one of the best-insulated fifth-wheel travel trailers on the market. Grand Design engaged in third-party testing of the Solitude to check its performance in extreme temperatures. At a desert-like 110 degrees Fahrenheit, the air conditioning was able to drop the internal temperature by 28 degrees. At a chilly 4 degrees Fahrenheit ambient temperature, the interior of the Solitude averaged 76 degrees front to back, and no water line freeze-ups resulted. The latter test took place with the 35,000-Btu furnace running and the 12-volt heat pads on the holding tanks; no auxiliary heat source was used, nor was the 5,000-Btu fireplace in operation. The unit used for the testing had single-pane windows, but dual panes are an available option. The exterior of the Solitude comes standard with high-gloss gel-coat fiberglass sidewalls and a painted front cap, but our test coach was finished in the stunning Cabernet full-body paint, with two layers of clear coat. The other available full-body paint color choice is Platinum. Frameless tinted windows and a power patio awning with LED lights come standard. Seamless thermoplastic polyolefin (TPO) material covers the walk-on roof. The 76-inch-by-30-inch entry door is accessible via a solid step that folds up into the RV for travel. A handy door-side spray port makes it easy to wash off any dirt or mud before the step is folded into the RV. Built-in shoe storage in the entry stepwell also helps owners to keep the interior of the RV clean. The Solitude uses a keyed-alike system, so the entry door key also fits the baggage compartments. A rear ladder affords access to the roof, and the unit is prewired for a backup camera. The test fifth-wheel was equipped with an optional pull-out kitchen in the pass-through storage area. It takes about 30 seconds to deploy and includes a large work area, a gas grill, and a sink with both hot and cold running water. The heated pass-through storage space does not cut into the bunk room inside the RV and is nice and low for easy accessibility. Panoramic windows and plentiful LED lights brighten the interior of the Grand Design Solitude. 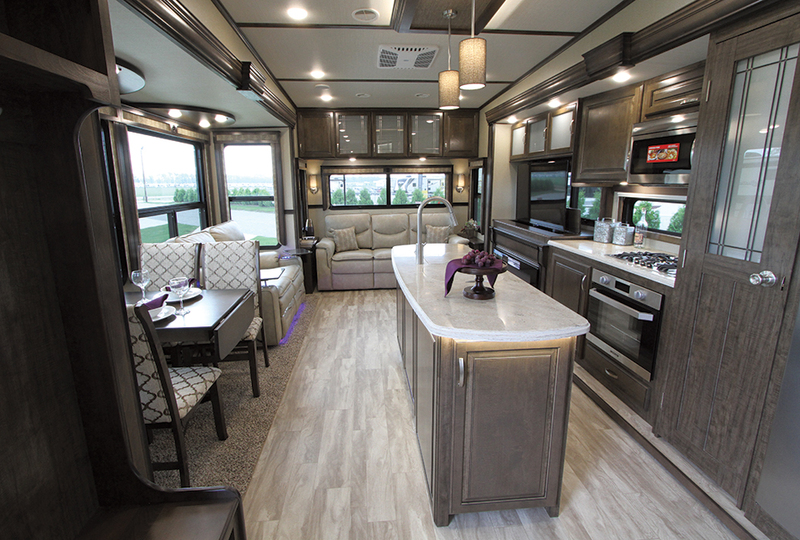 flooring and the medium-tone woodwork of the Java interior décor selection made the fifth-wheel bright and cheery, with just the right contrast to prevent a sterile, overly white look. All cabinetry and woodwork consist of hardwood, and the roller shades are encased in narrow valances that don’t overwhelm the interior décor. Recessed LED lighting and LED accent strips appear throughout the RV. With the exception of one, each Solitude floor plan has a coat closet right by the entry door. All of the heat vents are built into the cabinet toe spaces to eliminate floor-mounted registers, which aren’t that comfortable to step on and tend to collect dirt. This also eliminates weak spots in the floor. The fairly large galley area in the Solitude 373FB comes equipped well enough to please any RV cook. The galley island, topped with solid-surface material, holds a recessed, dual-basin stainless-steel sink that comes with removable solid-surface covers. A pair of suspended decorative fixtures with LED bulbs provide lighting over the island. One lower cabinet in the island comes prepped for an optional dishwasher drawer. The main galley area also features solid-surface countertop material and holds a professional-grade stainless-steel gas cooktop with a full-width gas oven beneath it. The overhead cabinetry contains a convection-microwave oven with an exhaust fan that is ducted to the outside. The cook can enjoy a nice view out the side window while preparing meals. In addition to the usual storage drawers and cabinets, the kitchen has a pull-out drawer for pet food and water bowls that will service midsize or small dogs. It also has a pull-out wastebasket storage area. Every Solitude floor plan boasts a large pantry. The test unit was equipped with an 18-cubic-foot stainless-steel gas-absorption refrigerator, although an optional French-door-style residential fridge is available. The main living area features an 81-inch-wide trifold sofa bed flanked by end tables. The entertainment center next to the galley holds a 50-inch LED TV on a power lift. The TV can be raised for viewing or lowered to allow an unobstructed view out the window. The base of the entertainment center holds a wide electric fireplace, as well as storage for electronic components such as the Blu-ray player and satellite receiver. Directly opposite the entertainment center is theater-style seating with heat and massage functions controlled by touch-pad switches built into the LED-illuminated cup holders on each arm. A pair of swivel tables can be swung up into position when desired or removed as needed. Next to the theater seating and opposite the galley island stands the wall-mounted, legless dining table, which comes with a leaf and is able to seat four persons comfortably in the padded freestanding chairs, two of which are foldable. The dinette is located in a wide slideout with a flat floor that supports all four dinette chairs with ease. A half bath is located on the main floor, at the bottom of stairs that lead to the upper front deck, so occupants can use the facilities without having to climb any steps. A handrail facilitates climbing the stairs to the upper deck, which holds the bedroom, the main bath, and a wardrobe. This particular unit had the optional king-size bed instead of the standard queen bed. A window is positioned above the residential-style headboard. Windows in the sides of the slideout allow for flow-through ventilation if desired. The bed raises to allow access to the under-bed storage area. A pair of nightstands flank the bed and are fitted with 120-volt-AC receptacles. Opposite the bed is a chest of drawers and a pair of cushioned seats that lift up to expose additional storage space. Just forward of the bedroom, through sliding hardwood doors graced with frosted glass panels, is the main bath. The bath contains a one-piece fiberglass shower enclosure with sliding glass doors. The opposite wall in the bath area is fitted with a wide vanity that has a solid-surface top and dual recessed sinks. A full-width mirrored medicine cabinet offers plenty of storage space. Rated at 350 cubic feet of air per minute, a Fan-Tastic Vent fan quickly exhausts any moisture or excessive heat from the bath area and comes with a rain sensor that automatically shuts the dome as needed. A pair of doors affords access to a true walk-in wardrobe. The wardrobe also comes prepped for a washer and dryer and has a large linen cabinet. The Solitude is designed for full-time use and thus doesn’t skimp on utilities. The 93-gallon fresh-water tank, 100-gallon gray water tank, and 100-gallon black-water tank are particularly well suited for stays at an RV park site with full hookups. A 12-gallon gas/electric water heater provides plenty of hot water for long showers. The Nautilus utility bay holds a whole-house water filtration system and a color-coded array of valves that facilitate operation of the fresh-water and sanitary systems. The bay is insulated and heated and capable of operation in below-freezing temperatures. In fact, the holding tank area is also insulated and heated, and 12-volt electric heat pads guard against freezing. The low-point drains are also located in the heated area. A detachable 50-amp power cord provides 120-volt-AC electrical power, and 12-volt-DC power requirements are met by deep-cycle batteries, a 55-amp converter, and a battery disconnect switch in the basement compartment. Grand Design also builds a solar tunnel into every Solitude. This tunnel allows an easy path for the owner or a dealer to install and connect rooftop solar panels to a charge controller and batteries in the basement. A 35,000-Btu propane furnace provides ducted heat to the interior living space as well as the basement cargo area, the Nautilus utility bay, and the holding tank bays. The furnace is located on the street side of the RV so that exhaust never exits into the patio area. The air-conditioning system also boasts an innovative design. To eliminate the drawbacks common to a typical ducted system, Grand Design uses a racetrack duct design with a pair of 15,000-Btu air conditioners. This directs airflow into a figure-eight pattern that allows each vent to deliver the same amount of air, at the same temperature. Grand Design literature indicates that the system delivers 23 percent more airflow than competitors. I had no way to measure that, but I can attest that this system was the quietest I have ever experienced, and the interior temperature was consistently comfortable. The Solitude is designed as an extended-stay fifth-wheel and is equipped with the features and utilities owners expect at that level. The residential-grade fixtures and appointments ensure longevity under frequent use. The wide body and frame stance create a very stable platform with lots of interior space. The insulation and HVAC systems may well be the Solitude’s most outstanding features. The interior was very quiet and comfortable, and the large panoramic windows provide the feeling of being in the outdoors while still enjoying the comforts of a residential home. The Grand Design Solitude 373FB test unit carried a suggested retail price of $107,142. With a 3-year structural warranty, 12-year roof covering warranty, 25-year warranty on the floor decking, and an excellent customer support facility, it’s easy to see why Grand Design continues to meet with success.